A comprehensive literature search was conducted using keyword searches to compile the content of the review. Articles and papers written in the English language only were included. Web of Science, The Cochrane Library, OVID MEDLINE, and PUBMED databases were used to search for the material. Keywords such as: SIJ Testing; SIJ Compression Test; and Reliability & Specificity of SIJ Testing, were used and combined to refine the search. Validity, reliability and diagnostic capability of specific SIJ tests is questionable (Schwarzer et al; 1995)  Stendal-Robinson et al (2005) investigated the reliability of seven SIJ tests in a limited number of both male and female subjects between the ages of 18-50 (n = 61). Two experienced therapists were used to complete the testing procedures with independent assessors to ensure consistency of protocol. All were blinded to the participant’s diagnosis, reducing experimental bias. Results were positive for pain provocation tests in general (percentage agreement = 67%-97%); however wide confidence variation was reported for the results of the compression test between therapists – possibly due to the subjective nature of the outcome measure, pain. Results inferred that combinations of pain provocation tests for the SIJ can be used with some accuracy to confirm diagnosis of SIJ injury. Reliability of the SIJ compression test alone cannot be guaranteed from these findings, but the use of multiple tests clinically may be used as a reliable measure. SIJ Compression testing can be a useful diagnostic apparatus alongside other pain provocative tests (Stanford and Burnham; 2010) In this study, Stanford and Burnham assessed the repeatability of SIJ provocative tests before and after an anaesthetic pain block in 34 subjects, finding a modest yet statistically significant results (p=0.3) in identifying SIJ pain. The study used low subject populations, who were not randomized, and only one clinician was used; increasing bias and questioning the validity of results. Cook and Hegedus (2013)  cite studies (n=12) that used the SIJ Compression Test, commenting on their reliability, sensitivity, and specificity, giving each a Quality of Diagnostic Accuracy Research Studies (QUADAS )score (0-14). A number of the studies looked at only reliability between examiners. Of the studies investigating sensitivity and specificity, it was found that specificity was fair, with sensitivity low to fair, indicating limitations in the use of the test as a screen. QUADAS scores ranged from 5-12, with a number not eligible as they had not analyzed sensitivity and specificity. A systematic review of the literature surrounding the reliability of pain provocation tests of the SIJ, in which the two reviewers were blinded, was completed by Van Der Wurff et al (2000)  The study classified the strength of 11 Randomised Controlled Trials by their study populations, test procedures and test results, giving each a score out of 100. The studies investigated the reliability of numerous SIJ tests, including SIJ Compression, which was the most frequently used test. Of the four studies investigating SIJ Compression, only Laslett and Williams (1994)  was cited as stating SIJ Compression tests to be reliable based on their Kappa score. Reliability was quashed in the remaining three trials (Potter and Rothstein 1985; McCombe et al 1989; and Strender et al 1997)    The inter-examiner reliability of the review was considered as ‘substantial agreement’ (k= 0.63), thus facilitating the view that the Compression test alongside other pain provocation tests, is not a reliable diagnostic tool. SIJ Compression test appears to be an unreliable and insensitive tool for diagnosis of SIJ conditions. The consensus appears to be that the Compression test may be a relevant assessment when combined with other SIJ pain provocation tests; however, as an individual test it cannot be relied upon. Reliability of SIJ pain provocative tests can be affected by external factors – the highly subjective nature of pain recognition and therapist application of the technique (Arab et al; 2008). ↑ 1.0 1.1 Laslett M, Williams M. (1994). The reliability of selected pain provocation tests for sacroiliac joint pathology. Spine. 19 (11), 1243-9. ↑ Magee DJ. Orthopedic physical assessment. Elsevier Health Sciences; 2013 Dec 4. ↑ Schwarzer AC, Aprill CN, Bogduk N. (1995). 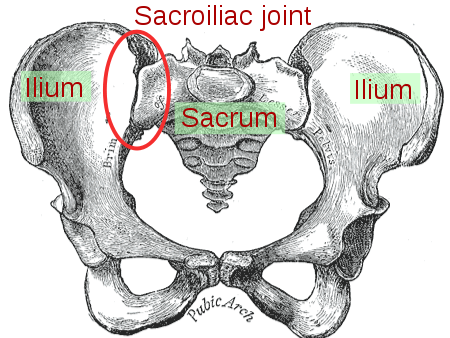 The sacroiliac joint in chronic lower back pain. Spine. 20, 31-7. ↑ Robinson HS, Brox JI, Robinson R, Bjelland E, Solem S, Telje T. The reliability of selected motion and pain provocaion tests for the sacroiliac joint. Man Ther.2007;12:72-79. ↑ Van der Wurff P, Meyne W, Hagmeijer RH. (2000). Clinical tests of the sacroiliac joint. Manual Therapy. 5 (2), 89-96. ↑ McCombe Pf, Fairbank JCT, Cockersole BC, Pysent PB. (1989). Reproducibility of physcial signs in low-back pain. Spine. 14 (9), 908-917. ↑ Strender LE, Sjobolm A, Sundell K, Ludwig R, Taube A. (1997). Inter-examiner reliability in physical examination of patients with low back pain. Spine. 22 (7), 814-820.